Rama avathar is called Dharma Avathar. He not only overcame 'adharma' (evil forces) but also taught man kind how to lead a perfect life of truthfulness, kindness, obeisance to parents etc. Now we will go to the story. In the north of the Ganga was the great kingdom called Kosala. Its capital was Ayodhya. King Dasartha ruled over the Kingdom. The people of Kosala were very happy contented and virtuous. The land was protected by a mighty army and no enemy could come any where near. But the King Dhasartha was always very sad because he had no children. King Dhasaradha wanted to perform asvamedha yaga in which a Horse is sacrificed in the alter to beget a progeny and consulted his religious teachers for their advice. They agreed that performing asvamedha yaga would bless the king with a heir to his throne. All arrangements were completed and the cermonies were setin motion strictly as enjoined by the Shastras. Out of the sacrificial fire came a goddess with a vessel of nectar which King dasaratha gave to his queens. In time Rama, Lakshmana, Bharatha and satrugun were born. The king was over-joyed and brought them up with great care. They were schooled in all arts, vedas and sasthras. They were so valorous that when the boys were only about 16 years old sage Viswamithra came to the king and complained that 'rakshasas' were obstructing the sage from performing their yagas etc and requested the king to to send Rama with him to kill the demons. Accordingly Rama set forth with the sage and killed all the demons. King Janakar 0f mathila kingdom was a very pious and righteous ruler. He was long without and issue and prayed to Lord Vishnu for a child. One day when the king was getting his land ploughed he found a female child with a strong bow At the time when Rama with Sage Viswamithra was in forests kill in gall the demons the news came that King Janaka was conducting a'swayam-vara'- ceremony to choose a bride-groom, for sita who was by then grown up as an young maiden. The condition laid down by King Janaka was who-ever broke the 'Shiva-dhanush' that was found along with sita in the field that person would be chosen to marry Sita. Viswamithra took Rama and Lakshmana to the 'swayamvara' where they were received with the respect due to the princes. A number of princes tried their and in bending the bow but they could not even lift it. However Rama effortlessly lifted the bow and broke into two to the amazement of all present and the delight of sita who was watching the proceedings from a balcony above the hall. 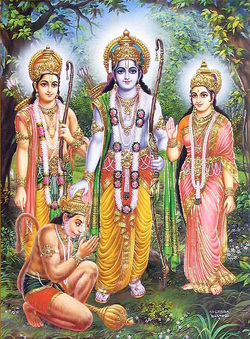 Rama married sita with great pomp and pageantry and went back to Ayodhya with his bride and Lakshman and Viswamithra. When it was time king Dasaratha wanted to crown Rama as the king and retire to the forest to devote his time to penance renouncing all pleasures of life. Called 'vana-prastha- asram this is considered the last stage in a man's life. Kaikeyi the third wife of dasaratha and a step-mother to Rama however wanted her son Bharatha to be crowned the king Long time earlier Kaikeyi saved the life of King dasaratha when his chariot over turned. Pleased King Dasaratha Promised kaikeyi two favours she would ask for. She however did not ask for anything at that time but said that she would make her wish known at the appropriate time later. Now she invoked the promise that King dasaratha had made and asked that Bharatha be crowned the King instead of Rama. Her second wish was that Rama should be banished to the forest and live there for 14 years as an ascetic before returning to the kingdom. King dasaratha was distressed in the extreme as he had a soft corner for Rama as his eldest son. But he was cornered. When Rama heard about his step mother's wishes he voluntarily steped down in favour of Bharatha and also agreed to go to the forest for 14 years. King dasaratha was saved the unhappy task of telling Rama to do these. But he was very sad at the thought of Rama going to the forest and died broken hearted. Rama was not shown the remains of his father but was hustled into going to the forest. Lakshmana his brother and sita his wife insistedon going with him and reluctantly Rama agreed. So the trio set for thon their 'vana-vasam' (residence in the forest).Bharatha the son of kaikeyi was however not happy to reign over the kingdom as his mother wanted him to but went into the forest in search of Rama to persuade him to return to ayodhya take the crown.When Bharata did meet his brother Rama would not agree to return to the kingdom but insisted that his step-mother's wishes should be fulfilled. So Bharata took the pair of Rama's wooden slippers with him to Ayodhya, kept those on the throne and ruled as the Vice-roy of Rama. Rama set up an 'ashram' in the forest and settled down there with his brother and wife. One day Rama went for a hunt and left Lakshmana behind as a guard for Sita. not countanence any other women in his life. He chasticed her and drove her away. She next went to Lakshmana with similar intentions. But Lakshmana did not like her obsene manners and to spite her he cut off her nose with his sword. Soorpanaga vowed to take revenge on both the brothers She ran to her brother Ravana and mis-represented her encounter with Rama and Lakshmana. She also told him about the rare beauty of Sita and kindled his desire to possess Sita. So he took the form of a deer and went near the ashram. Sita was so struck by the beauty of the animal and wanted to keep it in the ashram. She asked Rama to bring the deer to her. Rama went after the animal which was running fast taking Rama away from the ashram. At one point the deer gave out a cry "hey Lakshmana"mimicrying the voice of Rama. Sita was panic stricken and thought Rama was in deep trouble and asked Lakshmana to immediately go and see what was wrong. Lakshmana protested that his job was to guard Sita and nothing would have happened to valorous Rama. On Sita's insistence Lakshmana left the ashram to look for Rama. All the while Ravana was watching and when Lakshmana was out of sight pounced upon Sita and carried her away in his sky-chariot to Lanka as his kingdom was called. Rama was disconsolate when he returned and found sita missing. Heup braided Lakshmana for leaving sita unguarded. On regaining composure they both set forth in search of sita. On their way they saw the wounded jatayu the eagle who told them that he saw Ravanathe King of Lanka carrying away Sita south-ward. Jatayu was wounded by Ravana when he tried to rescue sita. So Rama and Lakshmana went south-ward towards Lanka in search of Sita. On the way they met Hanuman who became most faithful and devoted to Rama. Through Hanuman Rama got the following of Sugriva and his army of monkeys. Sugriva and his brother Vali had some family quarel and rama siding with Sugriva killed vali. This act bound Sugriva to Rama. Rama sent Hanuman to search for sita in the south-ward region and scourging around Hanuman found sita in the asoka- vana in Lanka disconsolate and sorrounded by evil ladies. Hanuman met sita and took from her a ring to show to rama that he had indeed found sita and returned to Rama who was over-joyed that his sita was still alive. Rama set forth with the army of monkeys to rescue sita. Knowing the powers of Ravana Rama prayed to lord for strength to fight Ravana and his hordes. Shiva granted him the boon. Armed with this Rama invaded Lanka. After an epic battle he vanquished Ravana and his army and rescued Sita. By this time the prescribed peiod of 'vana-vasa' was over. So Rama, Sita, Lakshmana and Hanuman the ever-faithful flew back to Ayodhya in a 'pushpaka- wimana' (sky-chariot bedecked in flowers)They were received by the people of Ayodhya with pomp and pageantry. Rama was crowned the king of Kosala and commenced his glorious rule. This in short is the epic story of Rama the perfect. Mahavishnu took this incarnation to show to the world an example in virtuous living. From another angle this marks the period when human solved as a perfect being in the long process of evolution.